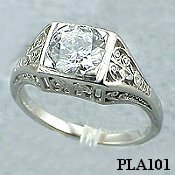 Stock #PLA101:1 Carat Cubic Zirconia Antique/Deco style Ring... Reproduced with Beautiful, Hand-Crafted, top quality Jewelry workmanship!... Blank for 1 carat or set with one of our Russian CZs Unique corner prongs, do not snag. Picture does not do justice to this piece! Also available in 14k White Gold or 14k Yellow Gold. 25% off enter platinum at checkout!